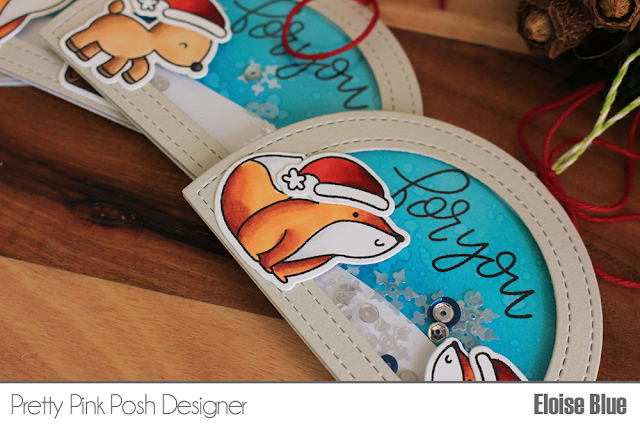 Hi everyone, today I'm helping Pretty Pink Posh participate in the 25 Days of Christmas Tags by Tracey McNeely. 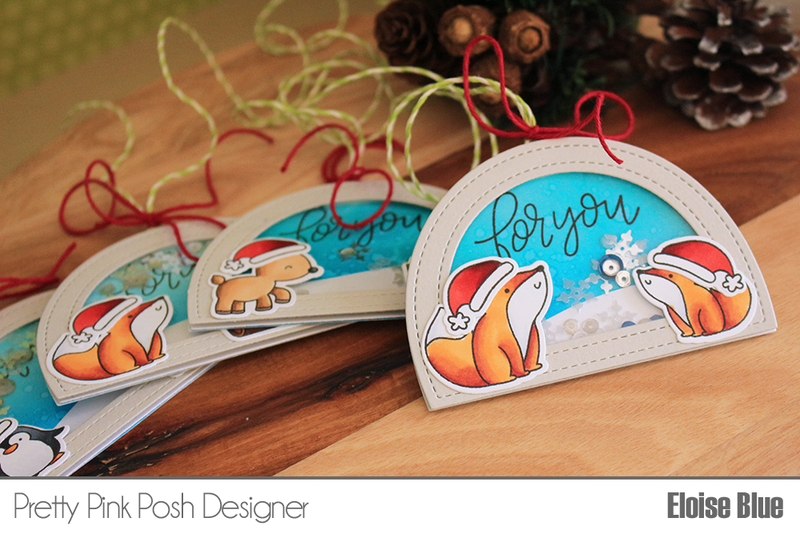 For these tags, I'll be using the new Winter Woodland stamp set along with a few other stamp sets and the Window Frames dies to create some shaker tags. To start off my tags today I used the Window Frames dies and cut them both out nested together four times from some light grey cardstock. I then used the largest die and cut out twelve white bases and also four pieces of acetate. I adhered the acetate to the back of the light grey pieces, two each of the white bases together, so I would have a nice back and front and for the last of the white ones, I cut little snow banks. Next, I ink blended some Peacock Feathers and Salty Ocean Distress Ink onto the white pieces to create a nice background for my tags. I then splattered some water on top to give a little water splotch effect. I then adhered my snow banks to the bottom of them also. For my sentiment I used the Everyday Greetings stamp set to stamp 'For You' onto each of the top of the tags with black ink. Before assembling my tags, I punched a small hole at the top of each of the tags for the twine to be threaded through. I then added a layer of foam tape behind the grey frames and then added some Starry Night Sequin Mix on top of my tag base and also some Sparkling Clear Snowflakes. I then removed the backers of foam tape and adhered them onto my bases. Next I used the Winter Wonderland, Reindeer Games and Winter Woodland stamp sets and stamped and coloured a few images from each. I also coloured a ton of Santa hats from Reindeer Games as I love adding Santa hats to all critters! Once I finished colouring with Copic Markers I die cut them all out and adhered them flat onto the front of my tags. For a finishing touch I added some green twine through the holes of my tags and finished them off with a red bow. Thanks so much for stopping by today and I hope you were inspired to make some shaker tags! Check by the Pretty Pink Posh blog to see more inspiration for tags and my video is linked down below. Love the little shaker tags. Love the little animals on these shaker tags. Your tags are ADORABLE, Eloise. SO pretty with all those precious details. Thanks for sharing in the 25 Days of Christmas Tags. Super cute - love the critters. Eloise, you never disappoint. These are awesome as always and that die set has been one I have wanted for sometime. Hopefully, one day I'll be able to get it. So cute. I like your coloring and the shape. OMG! 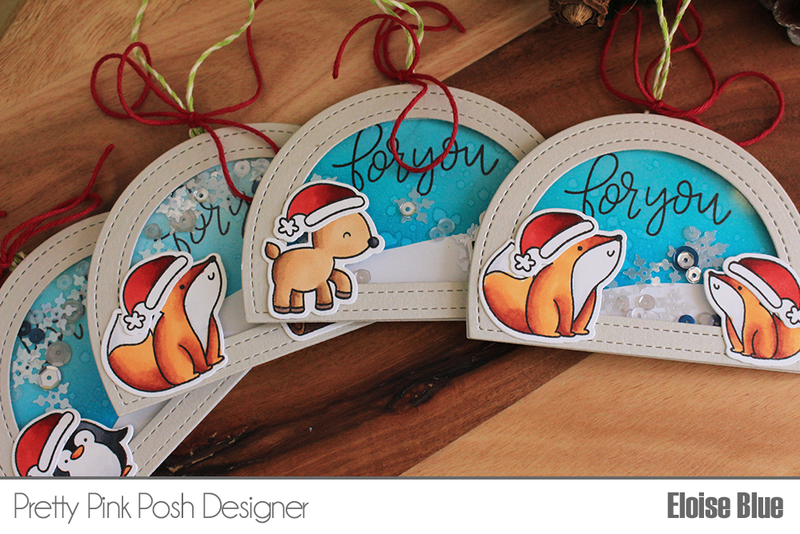 I'm totally in love for the cuteness of your shaped tags!!! Too cute!!! These are so cute!!! Awesome coloring!!! I love how you showed off so many of Pretty Pink Posh's adorable critters with your lovely snowglobe-esque tags - such a clever design! Thank you for the beautiful holiday inspiration! These are so cute....I especially love the shape of your tags. That is very unique die! I love these shaker tags...esp. love those foxes! Oh my heavens those are cute! Love the shape and your coloring is fantastic. Your little shaker tags are adorable. Love those cute critters wearing their Santa hats too. This is such an adorable set of tags !! Your tags are so cute, Eloise! Love your snowy shakers with the cute critters. Would look so cute hanging on a Christmas tree! Love this tag. very adorable!